Hyaluronic acid (HA) is a naturally-occurring molecule found all throughout the body that acts as a cushioning and lubricating agent for joints, nerves, hair, skin, and eyes. HA is particularly important to skin’s appearance because almost half of the body’s supply resides in the skin tissues, where the jelly-like substance helps keep it plump, soft and supple. Unfortunately, the body’s natural production of HA slows with age, beginning in our 20’s and progressively declining throughout our lifetime. Hyaluronidase is an enzyme found in skin that breaks down hyaluronic acid and facilitates the spread of fluids through tissues, thereby allowing the loss of moisture and possibly also impairing the skin’s ability to repair itself. In addition to natural degradation, free radicals produced from sun exposure further increase the breakdown of HA in the skin. Decreased hyaluronic acid leads to visible signs of aging including increased dryness, fine lines, wrinkles and sagging, as well as impaired local inflammatory response, and impaired tissue repair. 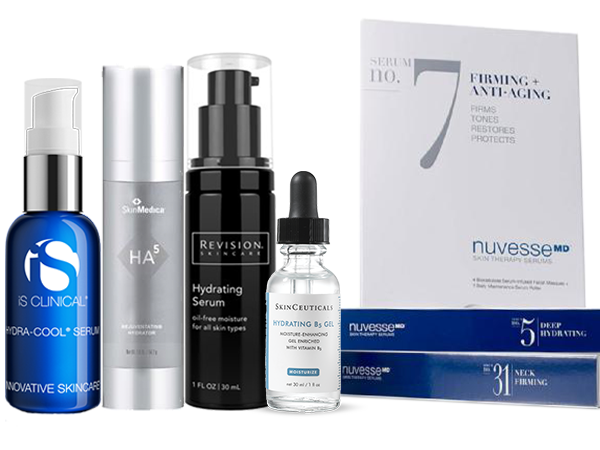 To fight signs of aging and rejuvenate your skin you need to supplement hyaluronic acid levels in both the dermis and the epidermis, and there are a variety of ways to accomplish this. The epidermis is the top layer of skin that provides a barrier and regulates the amount of water released from the body. HA in the epidermis attracts and retains more than 1,000 times its weight in water, keeping the epidermis hydrated. The dermis is the second layer of skin that is much thicker and does a lot for your body. The primary cells at work in the dermis are called fibroblasts. They maintain the dermis’s network of collagen and elastin proteins, which form the structure of the skin and give it its elasticity and resilience. HA in the dermis supports and adds volume to the collagen and elastin structure. Topical products can affect HA in two different ways. Topical HA products work in the epidermis to hydrate the skin by binding to water and creating a barrier that locks in moisture, creating softer skin. Topical tretinoin, a form of vitamin A, can trigger the fibroblasts in the dermis to increase the production of HA, leading to an increase of collagen and elastin. Increased collagen and elastin means increased volume and elasticity for smoother, tighter skin. Injectable HA is injected into the dermal tissue to restore volume and balance to the face. Using hyaluronic acid as a dermal filler adds support to facial structures and tissues that have lost volume or elasticity due to normal aging for a fuller more youthful appearance. Topical products like Skin Medica’s HA5 and Rejuvaphyl by MDRejuvena have been shown to suppress hyaluronidase, reducing the breakdown of the skin’s natural HA. Dermalinfusion can infuse HA into the epidermis increasing epidermal volume up to 70%. In addition to topical tretinoin, fractional laser treatments stimulate the dermis to upregulate HA, while simultaneously addressing fine lines and wrinkles, hyperpigmentation, and scarring. Call the Skin Klinic today (480) 451-1700 to find about all of our HA products and treatments options and to determine which HA regimen is best suited to help you achieve the beautiful, youthful skin you are looking for.